We are just a week into the month of May, but there are already some familiar names that have amassed hundreds of thousands of dollars in profits. Tom "durrrr" Dwan has gotten off to a quick start this month, raking in nearly $950k in profits over the first seven days of May. Dwan is still negative for the year (-$1.8 million dollars), but has managed to halve his losses over the past couple of months. Phil Ivey has had the second most profitable start to May, adding just under $700k to his bankroll over just 758 tracked hands. Ivey, who got off to a slow start in 2009, is now up almost $2 million dollars this year. Next on the list in May? Lukas "__FullFlush1__" Schwartz, who is up around $384k so far this month. Lukas Schwartz, aka "__FullFlush1__" on Full Tilt Poker, has been the talk of the poker world as of late. Schwartz burst onto the scene earlier in the year when he started tangling with some of the best cash game players in the world on Full Tilt Poker. Not only was he playing against the likes of Tom Dwan and Di "Urindanger" Dang, but he was also winning. From January 1st to April 30th, Schwartz was one of the most profitable players on Full Tilt Poker, netting himself over a million dollars in profits over that time. Schwartz also liked to talk trash, and plenty of it. In a much talked-about interview at the EPT Grand Final, Schwartz called Dwan "gay", which has just served to elevate their feud. This has led to talk of another "durrrr" challenge - Dwan vs Schwartz. Whether or not this actually ends up happening is an entirely different story.. 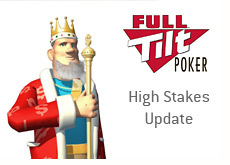 The top five list of the most profitable players on Full Tilt so far in May is rounded out by "luckexpress10" (+199k) and "PostFlopAction" (+123k). Gus Hansen, who is known for his outrageous bankroll swings, has experienced a bit of negative variance to start the month. After a total of 1,799 tracked hands, Hansen is currently down around $1.1 million dollars this month. Despite the loss, Hansen is still up around $1.75 million dollars in 2009.